Well we knew many of Ellen's friends would have to travel up for the festivities so we tried to be cognoscente of that when planning so we decided to throw both the shower and bachelorette party in one weekend. 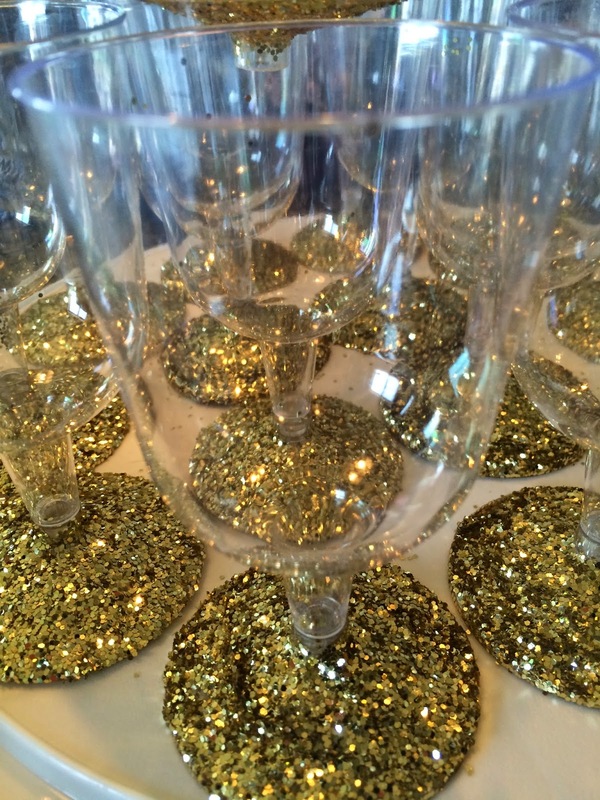 I love throwing a good party and planning all the little details to make it special. It truly is a way for me to express my love. Ellen was surprised and cried so once again, I think it was a success. 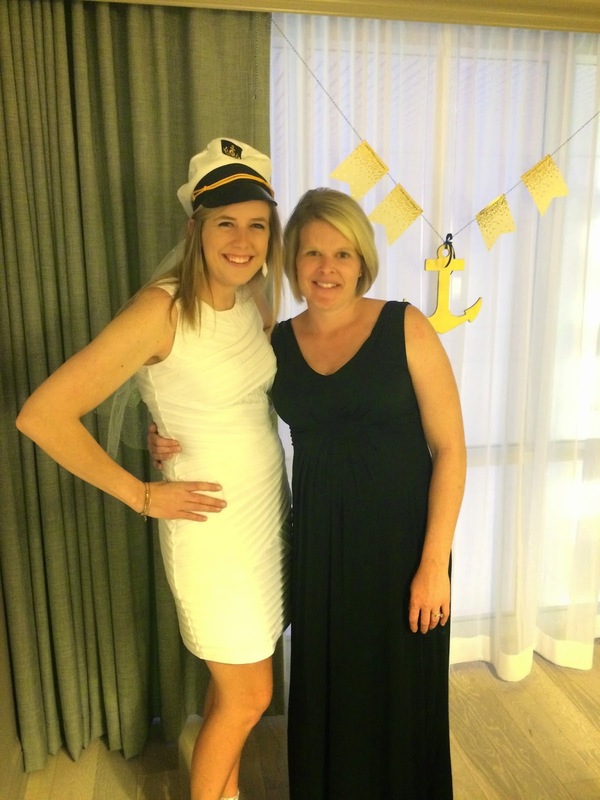 Now planning a shower when you know you will be 30 weeks pregnant is one thing but a bachelorette party...The plan was to have a low key dinner in at the suite and then a Bar Crawl to cap off the evening (for which I put her in the hands of her trusted friends). 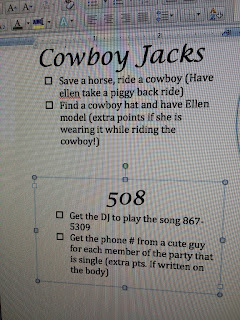 I made a little Bar crawl "itinerary" (get it ;). 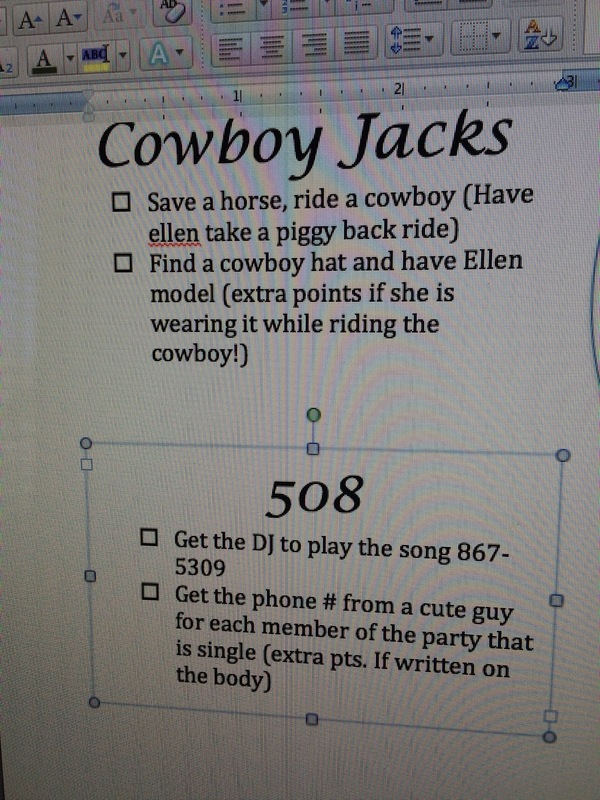 She chose 7 bars and I made up a little checklist for each bar. Having never been to the bars, some of them were trickier than others but they got most of the boxes checked and I heard lots of funny stories and fun along the way! 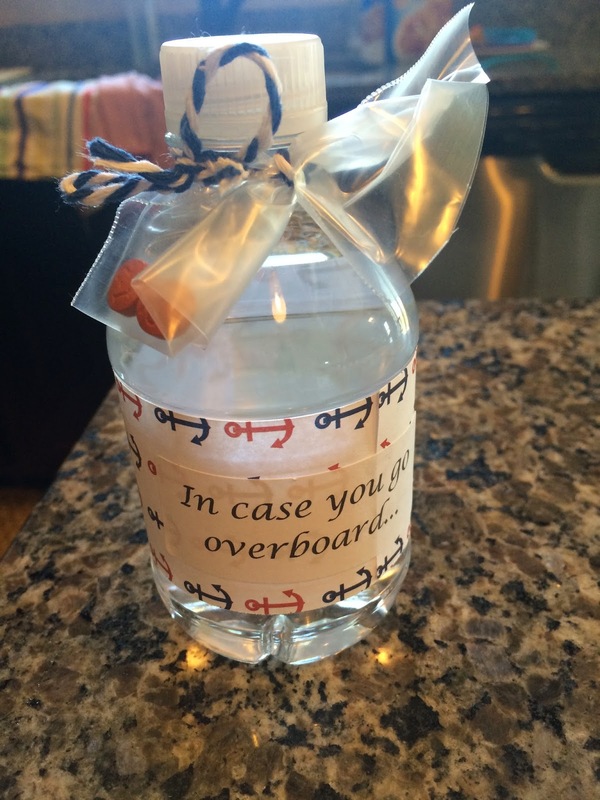 I had fun making all these things...the little water bottle above was the parting gift for the ladies. 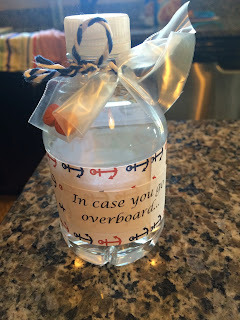 A bottle of water and 2 IB Profin...of course "In Case You go Overboard." They all took one for the road. 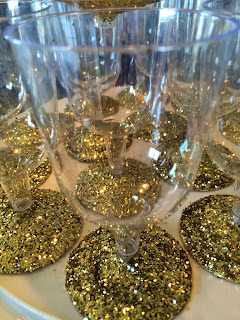 The cups were what the kids helped me with and they were sad there weren't any left...we will have to make them again...Dollar store flutes with mod lodged on glitter (although have you seen the spray glitter paint now?). 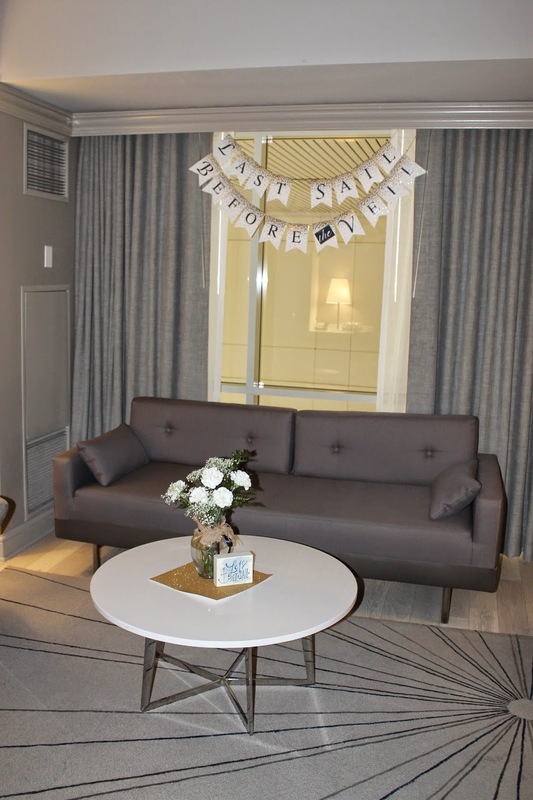 Funny story -- my mom booked the suite and the guy on the phone, when she made the reservation, said there was only standard suites available so she thought she booked a king suite. When I arrived, the guy helping me mentioned we had the best room in the house which surprised me given my mom's previous conversation. When I walked in I was STUNNED. It worked out great and there was plenty of room for everyone to spread out and enjoy. I had brought table cloths and things to use but the decor was so chic, I didn't even need it ;)! Thanks mom! 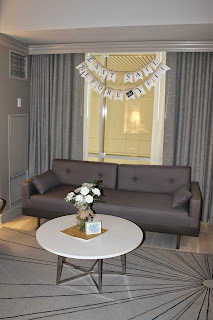 I made the fun banner - the banner itself was a Target project and then I cut navy letters using my silhouette! I got some carnations and baby breath and made some arrangements in spray painted gold wine bottles and jars. ...and used gold, navy and cream plates, napkins and silverware. 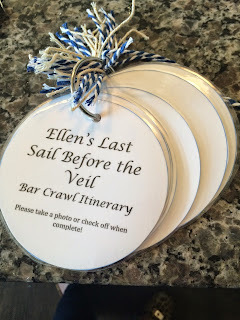 Along with a print saying "Ellen's Last Sail Before the Veil" logo from the invites I created...it was so fun to make! And I wanted a little something for the ladies to sign as a moment but I knew it needed to be consumable so we all signed a chalk spray painted bottle of champagne (she loves champagne) for her and Kristiaan to enjoy some romantic evening. The girls arrived around 7pm and we toasted the bride before digging into some AWESOME pizza Ellen had suggested. They delivered right to the hotel. Pizzeria Luce! Highly recommend their artisan pizzas, so many delicious options - my favorite was the pesto shrimp! After dinner we played a few games and opened gifts, hung out, they did A LOT of laughing and reminiscing and then freshened up, took some pictures and headed out. We picked the hotel for its proximity to everything and the weather was beautiful that weekend so they could walk to everything which was our hope! A lovely group of fun and sweet friends...thanks so much for helping celebrate Ellen's special day and showering with fun things to spice up their marriage!